Pictured above: With WH Press Secretary Sarah Sanders June 5, 2017. To watch interview June 6, 2017. Pictured above in the White House James Brady Daily Briefing Room Monday July 17, 2017. White House Communications Director Anthony Scaramucci commented on the ‘Fake news’ problem Friday July 21, 2017 at the White House in a daily briefing and addressed the challenge for President Trump to get his message out clearly to Americans. This gives rise of opportunity for President Trump to reach out more to members of the Christian media to share his message. Oddly enough though, there is not a significant daily group of Christian media present at the White House for President Trump to reach out to, therein lies a key problem. 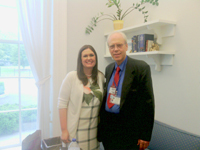 The question becomes, how do we get a good Christian media representation at White House press meetings? A good answer to this question to consider is prayer and financial support for the Christian media to have their offices located in Washington, D.C. supporting their daily trek to White House press meetings. 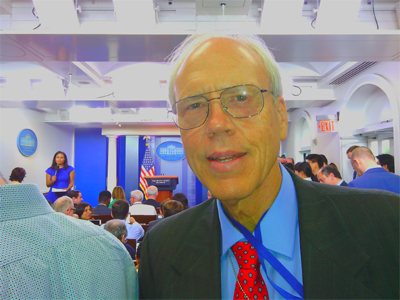 In my experience as a White House reporter, rarely do I witness other Christian media being called on during press conferences to ask a question. There is no rotation of Christian media presence, especially on the front row of the James Brady Press room, and Christians could ask, ‘Why is that?’ Now with President Trump’s conflict with getting out his message through the traditional news outlets, it might be good for him to consider reaching out now more to more credible news reporting outlets such as the Christian media and other news media that helped him get elected. The ‘Fake news’ sources are unlikely to be reformed. ‘Fake news’ that is misleading to some is not ‘Fake news’ to another. With a growing distrust in traditional news and other institutions, a migration to alternative news and social media flourishes. According to Andrew Klavan (2017), "mainstream American news is ALL fake because the major news outlets are so consistently biased toward the left." (1) ‘Fake news’ is definitely not something new. From a Christian perspective, ‘Fake news’ definition could even be expanded to include those news sources that do not support our Judeo/Christian values. I have witnessed a lot of disrespect of other reporters for President Trump and his press secretaries and their confrontations with news reporters regarding ‘Fake news.’ You can feel the tension and hostility of some of the press against President Trump. And one good way to diffuse this tension is by calling on more Christian reporters and other news sources. Please pray for me and others of the Christian media for favor in being called on to ask questions and have interviews with President Trump, Vice President Pence, other White House officials and other world leaders. Pictured above asking question about Israel and U.N. issues of President Trump press secretary Sean Spicer January 24, 2017. Pictured above: With WH Press Secretary Sean Spicer January 27, 2017. Pictured above asking question about Israel and U.N. issues of President Trump's Chief of Staff General Kelly October 12, 2017. 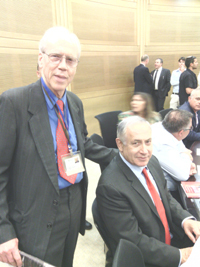 Pictured above: With Israel Prime Minister Benjamin Netanyahu May 8, 2017 (introduced to him by MK Sharren Haskel). 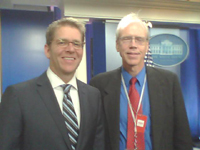 Pictured above: With White House Press Secretary Jay Carney July 18, 2012 when called on to ask a question of the Secretary of Agriculture Tom Vilsack. To watch my JESUS question of White House Press Secretary Jay Carney January 30, 2013. 1. Klavan, A. (2017). What is Fake News? For more information, visit our InterMountain Christian News web site and click on the ‘Donate’ banner to make your tax deductible donation in support of our Good News paper. Click on the ‘YouTube’ banner for our news interviews and other great videos. You can also call our office in Boise, Idaho at (208) 703-8688.